The Knesset is the name for Israel's parliament, or legislature, located in the capital Jerusalem. The major function of the Knesset is to legislate laws and revise them as necessary. Additional duties include establishing a government, taking policy decisions, reviewing government activities, and electing the President of the State and the State Comptroller. The Speaker of the Knesset acts as the controlling authority inside the walls. The Knesset took its name and fixed its membership at 120 from the Knesset Hagedolah (Great Assembly), the representative Jewish council convened in Jerusalem by Ezra and Nehemiah in the 5th century B.C.E. The mdoern Israeli Knesset convened for the first time ever on February 14, 1949, following the elections from January of that same year. This inaugural sitting succeeded the provisional government that had functioned as the Jewish community's parliament during the Mandate era and first few months of the state. In his speech opening the inaugural session in 1949, Israeli President Chaim Weizmann told the new parliament members that the aim of the Jewish state would be, before everything else, "to gather in the exiles from all parts of the world." He emphasized that this was a great day not only in the lives of the Jewish people but also in the history of the world. To mark the historic day, a procession of schoolchildren carrying Israeli flags and huge bouquets of flowers marched through the main streets of Jerusalem and stopped in the front of the Jewish Agency building, where Weizmann, Prime Minister David Ben Gurion, members of the first Cabinet, the newly-elected members of the Knesset and guests attended a solemn service in honor of the Israel Defense Forces soldiers killed in battle to help establish the State. Before the construction of its permanent home in the Givat Ram neighborhood of Jerusalem, the Knesset met in the Jewish Agency building in Jerusalem, the Kessem Cinema building in Tel Aviv and the Froumine building in Jerusalem. Who is in the Knesset? Members of Knesset (also known by their acronym, MK's) are elected every four years within the framework of parties that compete for the electorate's votes. Each party chooses its own Knesset candidates as it sees fit. A new Knesset begins to function after general elections, which determine its composition. In the first session after election, Knesset members declare their allegiance to Israel and the Knesset speaker and deputy speakers are elected. The Knesset usually serves for four years, but may dissolve itself or be dissolved by the prime minister any time during its term. Until a new Knesset is formally constituted following elections, full authority remains with the outgoing one. The current Knesset - the nineteenth iteration, election in January 2013 - is led by a coalition featuring the Likud and Yisrael Beiteinu parties. Twelve political parties are represented in this government, and it boasts 12 Arabs, 48 new members and a record 27 women. How Does the Knesset Work? The Knesset works in a two forms - the plenum and the committees. The plenum, the supreme authority of the house, has two annual sittings of at least eight months' duration. The two sittings together form a session. The Knesset may be convened during intersessions if 30 members demand this in writing or if the Government so requests. Resolutions of the plenum are taken by a majority of participating MKs, except for cases in which a special majority is required. The plenum elects the Speaker of the Knesset and one or more deputy speakers (the law does not specify the number). Deliberations in the plenum, presided over by the Speaker or a Deputy Speaker, are open to the media and the public. The agenda of Knesset meetings is set by the Speaker in accordance with Government proposals. One meeting each week is set aside for consideration of private members' bills. Every day that the Knesset is in session, time is reserved for ministers to reply to questions. Knesset debates take the form of general debates, motions for the agenda, parliamentary questions, and motions of no confidence. A general debate is held on bills or general matters of a political or other nature. Debates on bills conclude with a vote; debates on general matters may end without voting. A motion for the agenda is a preliminary debate concerning the inclusion of an issue raised by an MK on the Knesset agenda. A parliamentary question is asked by an MK of a minister on ministry affairs, to draw the attention of the Government and the public to an issue that, in the presenter's opinion, needs corrective action. Parliamentary questions are presented in writing, and the minister must reply in the Knesset plenum within a period of time set by Knesset bylaws. Since 1984, oral parliamentary questions have also been allowed; these must be replied to within two days, at which time members of other Knesset factions may ask additional questions. Any Knesset faction may submit a motion of no confidence in the Government; the Knesset must vote on the motion at its first meeting during the week following submission of the motion. If the no-confidence motion receives a majority of 61 votes, the defeated Government functions in a caretaker capacity until a new Government is established. The Knesset's main function, however, is legislative. While the Government is the sponsor of most legislation, any MK can present a bill, known as a "private member's bill." Bills go through three stages, beginning with a first reading, i.e., a general debate in the plenum. At this stage the bill may be accepted and referred to the appropriate committee, removed from the Knesset table, or returned to the Government. If the bill is accepted, it goes to a committee for the resolution of details. The Knesset has 12 standing committees: House (or Knesset) Committee, dealing with the Knesset agenda; Finance; Economics; Defense and Foreign Affairs; Interior and Environment; Immigration and Absorption; Education and Culture; Constitution, Law, and Justice; Labor and Social Affairs; Public Audit (Control); War against Drug Affliction and Advancing the Status of Women. Committee chairpersons are chosen by their members, on the recommendation of the House Committee, and their factional composition resembles that of the Knesset itself. Committees may elect subcommittees and delegate powers to them. They may also establish joint committees for issues concerning more than one committee. In addition to their legislative function, the committees discuss government regulations or any matter referred to them by the plenum. To further their deliberations they invite government ministers, senior officials, and experts in the matters being discussed. Committees may require explanation and information from relevant ministers in any matter within their competence, and the ministers, or persons appointed by them, must provide the explanation or information requested. The committee may propose as many amendments as it wishes, as long as the general topic of the bill is not impaired. The committee then returns the amended bill to the plenum for a second reading, where the deliberations and voting take place on each section separately. In the third and final reading, the bill is presented in its final form, as adopted in the second reading. While most Knesset votes are by show of hands, certain cases are resolved by secret ballot or by roll-call vote. 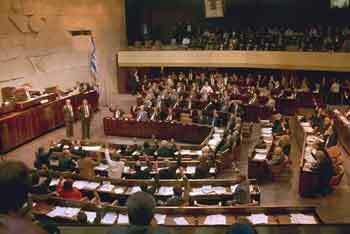 The Twelfth Knesset was the first to institute electronic voting. If a bill passes, it is signed by the presiding speaker and is later published in the Official Gazette, with the signatures of the president, prime minister, Knesset speaker and the minister responsible for the law's implementation. Finally, the state seal is placed on it by the minister of justice, and the bill becomes law. By law, MKs enjoy lifetime personal immunity from prosecution for votes, acts committed, or opinions expressed in the course of duty. During their term of office, they are also immune from a search of their homes or bodies (except for customs' checks) and are not subject to arrest unless caught in the commission of a violent crime, disturbance of the peace, or treason. This immunity can be lifted if the Knesset plenum so resolves. Finally, access to and activity in the Knesset building and compound require permission from the Speaker of the Knesset. Sources: Knesset interior photo from MidEastTruth courtesy of Ilan Friedman.